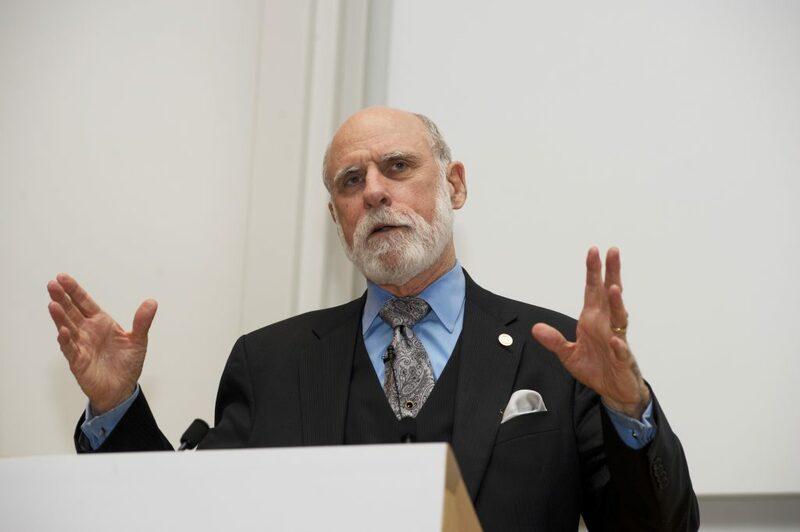 Dr Vinton G. Cerf has been awarded an OII Lifetime Achievement Award in recognition of his role in designing the TCP/IP protocol and his extensive and long-lasting contributions to the development and oversight of the Internet’s technical architecture. Vint Cerf speaking at the 2011 OII Internet Awards. He was awarded for his extraordinary contributions to the design and management of fundamental Internet architecture. Widely known as one of the ‘Fathers of the Internet,’ Cerf co-designed the TCP/IP protocols that underpin the Internet’s architecture during his tenure with the US Department of Defense’s Advanced Research Projects Agency (DARPA). Since then, Cerf has played a central role in many of the Internet’s major institutional developments, serving as founding President of the Internet Society from 1992 to 1995 and as a Chairman of the Internet Corporation for Assigned Names and Numbers (ICANN) from 2000 to 2007. He created the Internet Configuration Control Board in 1979 that became the Internet Activities Board and later the Internet Architecture Board; serving on the IAB from 1983-1993. In addition, Cerf is honorary chairman of the IPv6 Forum, dedicated to raising awareness and speeding introduction of the new Internet protocol. In December 1997, President Clinton presented the US National Medal of Technology to Cerf and his colleague, Robert E. Kahn, for founding and developing the Internet. They received the ACM Alan M. Turing award in 2004 for their work on the Internet protocols. Cerf currently serves as vice president and chief Internet evangelist for Google. In this role, he is responsible for identifying new enabling technologies to support the development of advanced, Internet-based products and services from Google. He is also an active public face for Google in the Internet world.